That rascally animated cat is back, with Fox setting a mid-June premiere for Garfield's latest direct-to-Blu-ray adventure. Following on the heels of its successful 'Dr. 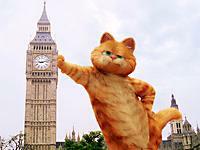 Doolittle' video premiere franchise, Fox will now bring the famous feline direct-to-Blu, setting a June 16 date for 'Garfield's Pet Force' (day-and-date with the standard DVD). Tech specs will see a BD-50 dual-layer disc with /AVC MPEG-4 video (1.78:1) with a DTS-HD Lossless Master Audio 5.1 Surround track. There are no supplements announced as yet, but we're sure there'll be a litter box full of goodies. You'll find the latest specs for 'Garfield's Pet Force' linked from our Blu-ray Release Schedule, where it's indexed under June 16.